The Tag Heuer Men’s CJF211A.BA0594 Link Automatic Day-Date Watch would be an elegant, intelligent addition to any busy man’s wardrobe. At $3,700, this watch is an investment piece, certainly, but not a timepiece that only the very wealthy can afford. Watch batteries are annoying, aren’t they? They’re easy to lose, tedious to change and your favorite watch’s very life depends upon them. Terrifying. 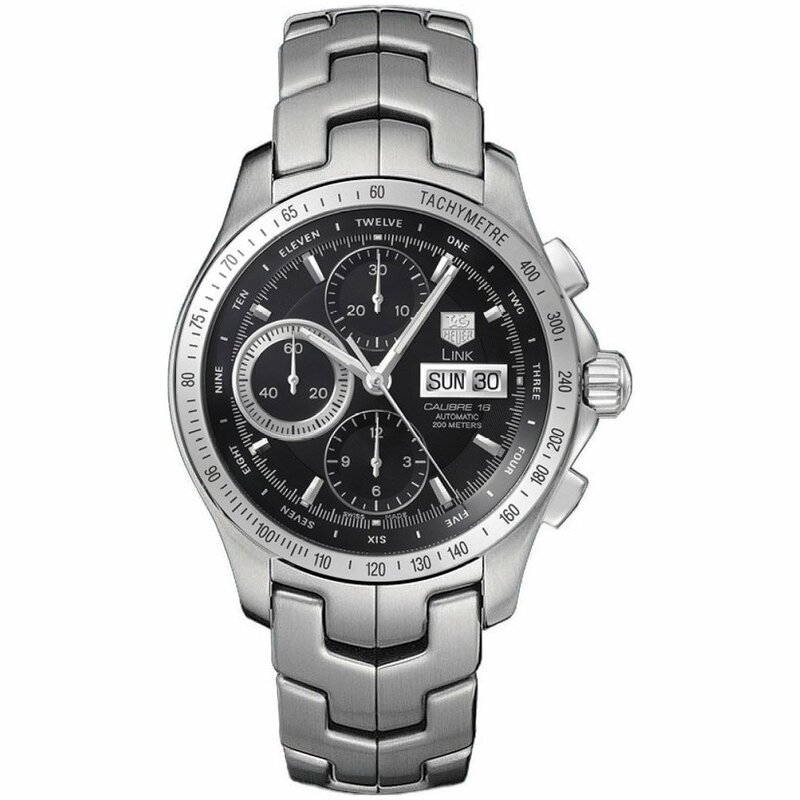 To fix this problem, the Tag Heuer Link eliminates batteries altogether. Instead of a tiny, temporary battery source, this ingenious watch’s Swiss movement is automatic: powered by the movement of your arms. This means that when you’re making coffee, you’re also charging your watch. Chasing the kids? Charging your watch. Watching television? Well, maybe not. But as long as your lifestyle isn’t too sedentary, you’ll never have to worry with resetting or battery changing again! At full charge, the CJF221A.BA0594 can keep time for about 72 hours – so there’s no need to wear it (or charge it) everyday. But, really, you’ll want to make this your everyday watch. After all, beautiful Tag Heuer watches with stainless steel bands don’t exactly grow on trees. And since the case is also stainless steel and the Link features a fold-over clasp with double push button safety, you don’t have to worry about wear, tear or loss. The addition of a scratch resistant sapphire window and a dual UV protective coating eliminates glare, reflection and any possible sun damage to the sumptuous black dial. The Link CJF211A.BA0594 would make a perfect groom’s gift, graduation present or personal treat for any man in need of a beautiful, dependable and durable timepiece. Since we all must consider cost in the current economic climate, more wallet-friendly Tag Heuer options include the CJF7110.BA0592 Calibre S ($3,300) and the WJF2050.BB059 Gold Link ($2,800). Neither of these, however, pairs the automatic Swiss movement and stainless steel durability that makes this intelligent Tag Heuer design so unique. For understated beauty, tough durability and ingenious movement construction, this watch earns five stars. The Tag Heuer Men’s CJF211A.BA0594 Link Automatic Day-Date Watch is certainly worth the money for a special man in your life.